The Wang Jingwei regime is the common name of the Reorganized National Government of the Republic of China (Chinese: 中華民國國民政府; pinyin: Zhōnghuá mínguó guómín zhèngfǔ), a puppet state of the Empire of Japan, located in eastern China. This should not be confused with the Republic of China under Chiang Kai-shek, which was a separate, non-Japanese government. It was ruled by a one-party totalitarian dictatorship under Wang Jingwei, an ex-Kuomintang (KMT) official. The region that it would administer was initially seized by Japan throughout the late 1930s with the beginning of the Second Sino-Japanese War. Wang, a rival of Chiang Kai-shek and member of the pro-peace faction of the KMT, defected to the Japanese side and formed a collaborationist government in occupied Nanjing (the traditional capital of China) in 1940. The new state claimed the entirety of China during its existence, portraying itself as the legitimate inheritors of the Xinhai Revolution and Sun Yat-sen's legacy as opposed to Chiang Kai-shek's government in Chongqing, but effectively only Japanese-occupied territory was under its direct control. Its international recognition was limited to other members of the Anti-Comintern Pact, which it was a signatory of. The Reorganized National Government existed until the end of World War II and the surrender of Japan in August 1945, at which point the regime was dissolved and many of its leading members were executed for treason. Republic of China (dark red) and Mengjiang (light red) within the Empire of Japan (pink) at its furthest extent. ^ The yellow pennant, which reads Peace, Anti-Communism, National Construction, was not attached to the flag itself but flew separately on the flagpole immediately above it. In 1943, the pennant, which was previously mandatory for outdoor use of the flag, was removed, which made the flag identical to that of their enemy, the Republic of China. The state was formed by combining the previous Reformed Government (1938–1940) and Provisional Government (1937–1940) of the Republic of China, puppet regimes which ruled the central and northern regions of China that were under Japanese control, respectively. Unlike Wang Jingwei's government, these regimes were not much more than arms of the Japanese military leadership and received no recognition even from Japan itself or its allies. 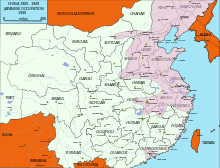 However, after 1940 the former territory of the Provisional Government remained semi-autonomous from Nanjing's control, under the "North China Political Council" of Wang Kemin, while the region of Mengjiang (puppet government in Inner Mongolia) was under Wang Jingwei's government only nominally. His regime was also hampered by the fact that the powers granted to it by the Japanese were extremely limited, and this was only partly changed with the signing of a new treaty in 1943 which gave it more sovereignty from Japanese control. The Japanese largely viewed it as not an end in itself but the means to an end, a bridge for negotiations with Chiang Kai-shek, which led them to often treat Wang with indifference. The regime is informally also known as the Nanjing Nationalist Government (Chinese: 南京國民政府; pinyin: Nánjīng Guómín Zhèngfǔ), the Nanjing Regime, or by its leader Wang Jingwei Regime (Chinese: 汪精衛政權; pinyin: Wāng Jīngwèi Zhèngquán). As the government of the Republic of China and subsequently of the People's Republic of China regarded the regime as illegal, it is also commonly known as Wang's Puppet Regime (Chinese: 汪偽政權; pinyin: Wāng Wěi Zhèngquán) or Puppet Nationalist Government (Chinese: 偽國民政府; pinyin: Wěi Guómín Zhèngfǔ) in Greater China. Other names used are the Republic of China-Nanjing, China-Nanjing, or New China. While Wang Jingwei was widely regarded as a favorite to inherit Sun Yat-sen's position as leader of the Nationalist Party, based upon his faithful service to the party throughout the 1910s and 20s and based on his unique position as the one who accepted and recorded Dr. Sun's last will and testament, he was rapidly overtaken by Chiang Kai-shek. By the 1930s, Wang Jingwei had been taken the position Minister of Foreign Affairs for the Nationalist Government under Chiang Kai-shek, a position that put him in control over the deteriorating Sino-Japanese relationship. While Chiang Kai-shek focused his primary attentions against the Communist Party of China, Wang Jingwei diligently toiled to preserve the peace between China and Japan, repeatedly stressing the need for a period of extended peace in order for China to elevate itself economically and militarily to the levels of its neighbor and the other Great powers of the world. Yet despite his efforts, Wang was unable to find a peaceful solution to prevent the Japanese from commencing an invasion into Chinese territory. By April 1938, the national conference of the KMT, held in retreat at the temporary capital of Chongqing, appointed Wang as vice-president of the party, reporting only to Chiang Kai-shek himself. Meanwhile, the Japanese advance into Chinese territory as part of the Second Sino-Japanese War continued unrelentingly. From his new position, Wang urged Chiang Kai-shek to pursue a peace agreement with Japan on the sole condition that the hypothetical deal "did not interfere with the territorial integrity of China". Chiang Kai-shek was adamant, however, that he would countenance no surrender, and that it was his position that, were China to be united completely under his control, the Japanese could readily be repulsed. As a result, Chiang continued to devote his primary attention to eradicating the Communists and ending the Chinese Civil War. 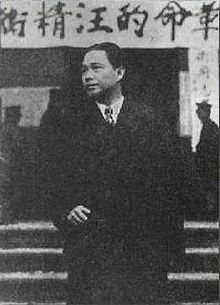 On December 18, 1938, Wang Jingwei and several of his closest supporters resigned from their positions and boarded a plane to Hanoi in order to seek alternative means of ending the war. From this new base, Wang began pursuit of a peaceful resolution to the conflict independent of the Nationalist Party in exile. In June 1939, Wang and his supporters began negotiating with the Japanese for the creation of a new Nationalist Government which could end the war despite Chiang's objections. To this end, Wang sought to discredit the Nationalists in Chongqing on the basis that they represented not the republican government envisioned by Dr. Sun, but rather a "one-party dictatorship", and subsequently call together a Central Political Conference back to the capital of Nanjing in order to formally transfer control over the party away from Chiang Kai-shek. These efforts were stymied by Japanese refusal to offer backing for Wang and his new government. Ultimately, Wang Jingwei and his allies would establish their almost entirely powerless new party and government in Nanjing in 1940, in the hope that Tokyo might eventually be willing to negotiate a deal for peace, which, though painful, might allow China to survive. Wang and his group were also damaged early on by the defection of the diplomat Gao Zongwu, who played a critical role in arranging Wang's defection after two years of negotiations with the Japanese, in January 1940. He had become disillusioned and believed that Japan did not see China as an equal partner, taking with him the documents of the Basic Treaty that Japan had signed with the Wang Jingwei government. He revealed them to the Kuomintang press, becoming a major propaganda coup for Chiang Kai-shek and discrediting Wang's movement in the eyes of the public as mere puppets of the Japanese. In theory, the Reorganized National Government controlled all of China with the exception of Manchukuo, which it recognized as an independent state. In actuality, at the time of its formation, the Reorganized Government controlled only Jiangsu, Anhui, and the north sector of Zhejiang, all being Japanese-controlled territories after 1937. 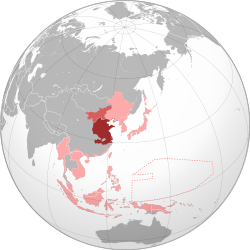 Thereafter, the Reorganized Government's actual borders waxed and waned as the Japanese gained or lost territory during the course of the war. During the December 1941 Japanese offensive the Reorganized Government extended its control over Hunan, Hubei, and parts of Jiangxi provinces. The port of Shanghai and the cities of Hankou and Wuchang were also placed under control of the Reformed Government after 1940. 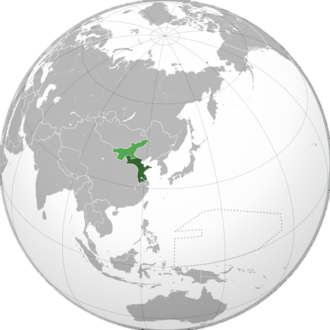 The Japanese-controlled provinces of Shandong and Hebei were theoretically part of this political entity, although they were actually administered by the Commander of the Japanese Northern China Area Army under a separate Japanese-controlled government based in Beijing. Likewise, the southern sectors had their own Japanese military commander and government based in Guangzhou. According to other sources, total extension of territory during 1940 period was 1,264,000 km2. In 1940 an agreement was signed between the Inner Mongolian puppet state Mengjiang and the Nanjing regime, incorporating the former into the latter as an autonomous part. With Nanjing still rebuilding itself after the devastating assault and occupation by the Japanese Imperial Army, the fledgling Reorganized Nationalist Government turned to Shanghai as its primary focal point. 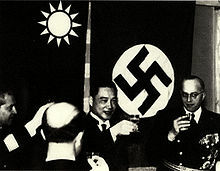 With its key role as both an economic and media center for all China, close affiliation to Western Imperial powers even despite the Japanese invasion, and relatively sheltered position from attacks by KMT and Communist forces alike, Shanghai offered both sanctuary and opportunity for Wang and his allies' ambitions. Once in Shanghai, the new regime quickly moved to take control over those publications already supportive of Wang and his peace platform, while also engaging in violent, gang-style attacks against rival news outlets. By November 1940, the Reorganized Nationalist Party had secured enough local support to begin hostile takeovers of both Chinese courts and banks still under nominal control by the KMT in Chongqing or Western powers. Buoyed by this rapid influx of seized collateral, the Reorganized Government under its recently appoint Finance Minister, Zhou Fohai, was able to issue a new currency for circulation. Ultimately however, the already limited economic influence garnered by the new banknotes was further diminished by Japanese efforts to contain the influence of the new regime, at least for a time, to territories firmly under Japanese control like Shanghai and other isolated regions of the Yangtze Valley. The administrative structure of the Reorganized National Government included a Legislative Yuan and an Executive Yuan. Both were under the president and head of state Wang Jingwei. However, actual political power remained with the commander of the Japanese Central China Area Army and Japanese political entities formed by Japanese political advisors. After obtaining Japanese approval to establish a national government in the summer of 1940, Wang Jingwei ordered the 6th National Congress of the Kuomintang to establish this government in Nanjing. The dedication occurred in the Conference Hall, and both the "blue-sky white-sun red-earth" national flag and the "blue-sky white-sun" Kuomintang flag were unveiled, flanking a large portrait of Sun Yat-sen.
On the day the new government was formed, and just before the session of the "Central Political Conference" began, Wang visited Sun's tomb in Nanjing's Purple Mountain to establish the legitimacy of his power as Sun's successor. Wang had been a high-level official of the Kuomintang government and, as a confidant to Sun, had transcribed Sun's last will, the Zongli's Testament. To discredit the legitimacy of the Chongqing government, Wang adopted Sun's flag in the hope that it would establish him as the rightful successor to Sun and bring the government back to Nanjing. A principal goal of the new regime was to portray itself as the legitimate continuation of the former Nationalist government, despite the Japanese occupation. To this end, the Reorganized government frequently sought to revitalize and expand the former policies of the Nationalist government, often to mixed success. While Wang had been successful in securing from Japan a "basic treaty" recognizing the foundation of his new party in November 1940, the produced document granted the Reorganized Nationalist Government almost no powers whatsoever. This initial treaty precluded any possibility for Wang to act as intermediary with Chiang Kai-shek and his forces in securing a peace agreement in China. Likewise, the regime was afforded no extra administrative powers in occupied China, save those few previously carved out in Shanghai. Indeed, official Japanese correspondence regarded the Nanjing regime as trivially important, and urged any and all token representatives stationed with Wang and his allies to dismiss all diplomatic efforts by the new government which could not directly contribute to a total military victory over Chiang and his forces. Hoping to expand the treaty in such a way as to be useful, Wang formally traveled to Tokyo in June 1941 in order to meet with prime minister Fumimaro Konoe and his cabinet to discuss new terms and agreements. Unfortunately for Wang, his visit coincided with the Nazi invasion of the Soviet Union, a move which further emboldened officials in Tokyo to pursue total victory in China, rather than accept a peace deal. In the end, Konoe eventually agreed to provide a substantial loan to the Nanjing government as well as increased sovereignty; neither of which came to fruition, and indeed, neither of which were even mentioned to military commanders stationed in China. As a slight conciliation, Wang was successful in persuading the Japanese to secure official recognition for the Nanjing Government from the other Axis Powers. As the Japanese offensive stalled around the Pacific, conditions remained generally consistent under Wang Jingwei's government. The regime continued to represent itself as the legitimate government of China, continued to appeal to Chiang Kai-shek to seek a peace deal, and continued to chafe under the extremely limited sovereignty afforded by the Japanese occupiers. Yet by 1943, Japanese leaders including Hideki Tojo, recognizing that the tide of war was turning against them, sought new ways to reinforce the thinly stretched Japanese forces. To this end, Tokyo finally found it expedient to fully recognize Wang Jingwei's government as a full ally, and a replacement Pact of Alliance was drafted for the basic treaty. This new agreement granted the Nanjing government markedly enhanced administrative control over its own territory, as well as increased ability to make limited self-decisions. Despite this windfall, the deal came far too late for the Reorganized government to have sufficient resources to take advantage of its new powers, and Japan was in no condition to offer aid to its new partner. As a result of general chaos and wartime various profiteering efforts of the conquering Japanese armies, already considerable illegal opium smuggling operations expanded greatly in the Reorganized Nation Government's territory. Indeed, Japanese forces themselves became arguably the largest and most widespread traffickers within the territory under the auspices of semi-official narcotics monopolies. While initially too politically weak to make inroads into the Japanese operations, as the war began to turn against them, the Japanese government sought to incorporate some collaborationist governments more actively into the war effort. To this end in October 1943 the Japanese government signed a treaty with the Reorganized Nationalist Government of China offering them a greater degree of control over their own territory. As a result, Wang Jingwei and his government were able to gain some increased control over the opium monopolies. Negotiations by Chen Gongbo were successful in reaching an agreement to cut opium imports from Mongolia in half, as well as an official turnover of state-sponsored monopolies from Japan over to the Reorganized Nationalist Government. Yet, perhaps due to financial concerns, the regime sought only limited reductions in the distribution of opium throughout the remainder of the war. The Beijing administration (East Yi Anti-Communist Autonomous Administration) was under the commander-in-chief of the Japanese Northern China Area Army until the Yellow River area fell inside the sphere of influence of the Japanese Central China Area Army. During this same period the area from middle Zhejiang to Guangdong was administered by the Japanese North China Area Army. These small, largely independent fiefdoms had local money and local leaders, and frequently squabbled. Wang Jingwei traveled to Tokyo in 1941 for meetings. In Tokyo the Reorganized National Government Vice President Zhou Fohai commented to the Asahi Shimbun newspaper that the Japanese establishment was making little progress in the Nanjing area. This quote provoked anger from Kumataro Honda, the Japanese ambassador in Nanjing. Zhou Fohai petitioned for total control of China's central provinces by the Reorganized National Government. In response, Imperial Japanese Army Lt. Gen. Teiichi Suzuki was ordered to provide military guidance to the Reorganized National Government, and so became part of the real power that lay behind Wang's rule. With the permission of the Japanese Army, a monopolistic economic policy was applied, to the benefit of Japanese zaibatsu and local representatives. Though these companies were supposedly treated the same as local Chinese companies by the government, the president of the Yuan legislature in Nanjing, Chen Gongbo, complained that this was untrue to the Kaizō Japanese review. The Reorganized National Government of the Republic of China also featured its own embassy in Yokohama, Japan (as did Manchukuo). The Nanjing Nationalist Government received little international recognition, being recognized only by some of the Axis powers. Initially, its main sponsor, Japan, hoped to come to a peace accord with Chiang Kai-shek and held off official recognition for the Wang Jingwei regime for six months after its founding, until 30 November 1940. In July 1941, the Nanjing Government was recognized as the legitimate government of China by Germany and Italy. Soon after, Spain, Slovakia, Romania, Bulgaria, Croatia, and Denmark also recognized the Wang Jingwei regime as the legitimate government of China. The Empire of Manchukuo and the Nanjing regime recognized each other and maintained diplomatic and trade missions within each other's territories. After Japan established diplomatic relations with the Holy See in 1942, they and their ally Italy pressured Pope Pius XII to recognize the Nanjing regime and allow a Chinese envoy to be appointed to the Vatican, but he refused to give in to these pressures. Instead the Vatican came to an informal agreement with Japan that their apostolic delegate in Beijing would pay visits to Catholics in the Nanjing government's territory. The Pope also ignored the suggestion of the aforementioned apostolic delegate, Mario Zanin, who recommended in October 1941 that the Vatican recognizes the Wang Jingwei regime as the legitimate government of China. Vichy France, despite being aligned with the Axis, resisted Japanese pressure and also refused to recognize the Wang Jingwei regime, with French diplomats in China remaining accredited to the government of Chiang Kai-shek. On 9 January 1943, the Reorganized National Government signed the "Treaty on Returning Leased Territories and Repealing Extraterritoriality Rights" with Japan, which abolished all foreign concessions within occupied China. Reportedly the date was originally to have been later that month, but was moved to January 9 to be before the United States concluded a similar treaty with Chiang Kai-shek's government. During its existence, the Reorganized National Government nominally led a large army that was estimated to have included 300,000 to 500,000 men, along with a smaller navy and air force. Although its land forces possessed limited armor and artillery, they were primarily an infantry force. Military aid from Japan was also very limited despite Japanese promises to assist the Nanjing regime in the "Japan–China Military Affairs Agreement" that they signed. All military matters were the responsibility of the Central Military Commission, but in practice that body was mainly a ceremonial one. In reality, many of the army's commanders operated outside of the direct command of the central government in Nanjing. The majority of its officers were either former National Revolutionary Army personnel or warlord officers from the early Republican era. Thus their reliability and combat capability was questionable, and Wang Jingwei was estimated to only be able to count on the loyalty of about 10% to 15% of his nominal forces. Among the reorganized government's best units were three Capital Guards divisions based in Nanjing, Zhou Fohai's Taxation Police Corps, and the 1st Front Army of Ren Yuandao. 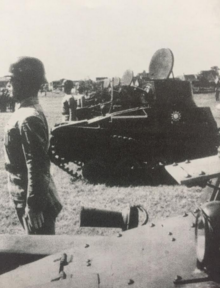 The majority of the government's forces were armed with a mix of captured Nationalist weaponry and a small amount of Japanese equipment, the latter mainly being given to Nanjing's best units. The lack of local military industry for the duration of the war meant that the Nanjing regime had trouble arming its troops. While the army was mainly an infantry force, in 1941 it did receive 18 Type 94 tankettes for a token armored force, and reportedly they also received 20 armored cars and 24 motorcycles. The main type of artillery in use were medium mortars, but they also possessed 31 field guns (which included Model 1917 mountain guns)—mainly used by the Guards divisions. Oftentimes, the troops were equipped with the German Stahlhelm, which were used in large quantities by the Chinese Nationalist Army. For small arms, there was no standard rifle and a large variety of different weapons were used, which made supplying them with ammunition difficult. The most common rifles in use was the Chinese version of the Mauser 98k and the Hanyang 88, while other notable weapons included Chinese copies of the Czechoslovakian ZB-26 machine guns. Along with the great variation in equipment, there was also a disparity in sizes of units. Some "armies" had only a few thousand troops while some "divisions" several thousand. There as a standard divisional structure, but only the elite Guards divisions closer to the capital actually had anything resembling it. In addition to these regular army forces, there were multiple police and local militia, which numbered in the tens of thousands, but were deemed to be completely unreliable by the Japanese. Most of the units located around Beijing in northern China remained, in effect, under the authority of the North China Political Council rather than that of the central government. In an attempt to improve the quality of the officer corps, multiple military academies had been opened, including a Central Military Academy in Nanjing and a Naval Academy in Shanghai. In addition there was a military academy in Beijing for the North China Political Council's forces, and a branch of the central academy in Canton. A small navy was established with naval bases at Weihaiwei and Qingdao, but it mostly consisted of small patrol boats that were used for coastal and river defense. Reportedly, the captured Nationalist cruisers Ning Hai and Ping Hai were handed over to the government by the Japanese, becoming important propaganda tools. However, the Imperial Japanese Navy took them back in 1943 for its own use. In addition there were two regiments of marines, one at Canton and the other at Weihaiwei. By 1944, the navy was under direct command of Ren Yuandao, the naval minister. An Air Force of the Reorganized National Government was established in May 1941 with the opening of the Aviation School and receiving three aircraft, Tachikawa Ki-9 trainers. In the future the air force received additional Ki-9 and Ki-55 trainers as well as multiple transports. Plans by Wang Jingwei to form a fighter squadron with Nakajima Ki-27s did not come to fruition as the Japanese did not trust the pilots enough to give them combat aircraft. Morale was low and a number of defections took place. The only two offensive aircraft they did possess were Tupolev SB bombers which were flown by defecting Nationalist crews. unused example of a Wang Jingwei regime passport, circa 1941. The Reorganized National Government's army was primarily tasked with garrison and police duties in the occupied territories. It also took part in anti-partisan operations against Communist guerrillas, such as in the Hundred Regiments Offensive, or played supporting roles for the Imperial Japanese Army (IJA). During the conflicts in central China, the Japanese utilized several methods to recruit Chinese volunteers. Japanese sympathisers including Nanjing's pro-Japanese governor, or major local landowners such as Tao-liang, were used to recruit local peasants in return for money or food. The Japanese recruited 5,000 volunteers in the Anhui area for the Reorganized National Government Army. Japanese forces and the Reorganized National Government used slogans like "Drop Your Weapons, and Take the Plow", "Oppose the Communist Bandits" or "Oppose Corrupt Government and Support the Reformed Government" to dissuade guerrilla attacks and buttress its support. Buddhist leaders inside the occupied Chinese territories ("Shao-Kung") were also forced to give public speeches and persuade people of the virtues of a Chinese alliance with Japan, including advocating the breaking-off of all relations with Western powers and ideas. In 1938, a manifesto was launched in Shanghai, reminding the populace the Japanese alliance's track-record in maintaining "moral supremacy" as compared to the often fractious nature of the previous Republican control, and also accusing Generalissimo Chiang Kai-Shek of treason for maintaining the Western alliance. In support of such efforts, in 1941 Wang Jing-wei proposed the Qingxiang Plan to be applied along the lower course of the Yangtze River. A Qingxiang Plan Committee (Qingxiang Weiyuan-hui) was formed with himself as Chairman, and Zhou Fohai and Chen Gongbo (as first and second vice-chairmen respectively). Li Shiqun was made the Committee's secretary. Beginning in July 1941, Wang maintained that any areas to which the plan was applied would convert into "model areas of peace, anti-communism, and rebuilders of the country" (heping fangong jianguo mofanqu). It was not a success. Japanese under the regime had greater access to coveted wartime luxuries, and the Japanese enjoyed things like matches, rice, tea, coffee, cigars, foods, and alcoholic drinks, all of which were scarce in Japan proper, but consumer goods became more scarce after Japan entered World War II. In Japanese-occupied Chinese territories the prices of basic necessities rose substantially as Japan's war effort expanded. In Shanghai in 1941, they increased elevenfold. Since Wang's government held authority only over territories under Japanese military occupation, there was a limited amount that officials loyal to Wang could do to ease the suffering of Chinese under Japanese occupation. Wang himself became a focal point of anti-Japanese resistance. He was demonised and branded as an "arch-traitor" in both KMT and Communist rhetoric. Wang and his government were deeply unpopular with the Chinese populace, who regarded them as traitors to both the Chinese state and Han Chinese identity. Wang's rule was constantly undermined by resistance and sabotage. The strategy of the local education system was to create a workforce suited for employment in factories and mines, and for manual labor. The Japanese also attempted to introduce their culture and dress to the Chinese. Complaints and agitation called for more meaningful Chinese educational development. Shinto temples and similar cultural centers were built in order to instill Japanese culture and values. These activities came to a halt at the end of the war. Chen Gongbo: President and Head of State after the death of Wang. Also, President of the Legislative Yuan and Mayor of the Shanghai occupied sector. Zhou Longxiang: Diplomat, Chief Secretary of the Executive Yuan, Chief of the Civil Servants. Having died before the war had ended, Wang Jingwei did not join his fellow Reorganized Nationalist Government leaders on trial for treason in the months that followed the Japanese surrender. Instead he, alongside his vice president Chen Gongbo who was tried and sentenced to death by the victorious Nationalists, was given the title Hanjian meaning arch-traitor to the Han people. In the following decades, Wang Jingwei and the entire reputation of the collaborationist government have undergone considerable scholastic debate. In general, evaluations produced by scholars working under the People's Republic of China have held the most critical interpretations of the failed regime, Western scholars typically holding the government and Wang Jingwei especially in a sympathetic light, with Taiwanese scholars falling somewhere in the middle. Lust, Caution is a 1979 novella by Chinese author Eileen Chang which was later turned into an award-winning film by Ang Lee. The story is about a group of young university students who attempt to assassinate the Minister of Security of the Reorganized National Government. During the war, Ms. Chang was married to Hu Lancheng, a writer who worked for the Reorganized National Government and the story is believed to be largely based on actual events. The 2009 Chinese film The Message is a thriller/mystery in the vein of a number of Agatha Christie novels. The main characters are all codebreakers serving in the Reorganized National Government's military, but one of them is a Kuomintang double-agent. A Japanese intelligence officer detains the group in a castle and attempts to uncover which of them is the spy using psychological and physical coercion, uncovering the protagonists' bitter rivalries, jealousies, and secrets as he does so. ^ Bate (1941), p. 80–84. ^ Bate (1941), pp. 130–135. ^ Bate (1941), p. 136. ^ Bate (1941), p. 144. ^ Bunker (1972), pp. 149–160. ^ Boyle (1972), pp. 277–280. ^ MacKinnon & Lary (2007), p. 162. ^ a b Bunker (1972), pp. 252–263. ^ a b Martin (2003), pp. 365–410. ^ a b Bunker (1972), pp. 264–280. ^ Matos, Christine; Caprio, Mark (2015). Japan as the Occupier and the Occupied. New York, NY: Palgrave Macmillan. pp. 152–160. ISBN 978-1-137-40810-5. ^ Martin (2003), p. 385. ^ Martin (2003), pp. 392–394. ^ Boyle (1972), p. 301. ^ Dorn (1974), p. 243. ^ Cotterell (2009), p. 217. ^ Brodsgaard (2003), p. 111. 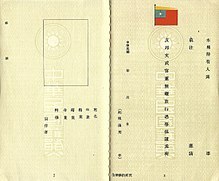 ^ Chinese puppet government travel document Archived 2017-12-22 at the Wayback Machine. Published 23 September 2016. Retrieved 19 December 2017. ^ Pollard (2014), p. 329. ^ The "Magic" Background to Pearl Harbor, Volume 3. Department of Defense, pp. 243–247. ^ Young (2013), pp. 250–251. ^ Wang (2016), pp. 31–32. ^ Frederic Wakeman, Jr. “Hanjian (Traitor) Collaboration and Retribution in Wartime Shanghai.” In Wen-hsin Yeh, ed. Becoming Chinese: Passages to Modernity and Beyond. (Berkeley: University of California Press, 2000), 322. ^ Chen, Jian-yue (2004). "American studies of Wang Jingwei:defining Nationalism". World History Review. Martin, Brian G. (2003-01-01). "'in My Heart I Opposed Opium': Opium and The Politics of the Wang Jingwei Government, 1940–45". European Journal of East Asian Studies. 2 (2): 365–410. JSTOR 23615144. Bate, Don (1941). Wang Ching Wei: Puppet or Patriot. Chicago: RF Seymour. Barrett, David P.; Shyu, Larry N., eds. (2001). Chinese Collaboration with Japan, 1932–1945: The Limits of Accommodation. Stanford University Press. Behr, Edward (1987). The Last Emperor. Recorded Picture Co. (Productions) Ltd and Screenframe Ltd.
Boyle, John H. (1972). China and Japan at War, 1937–1945: The Politics of Collaboration. Harvard University Press. Brodsgaard, Kjeld Erik (2003). China and Denmark: Relations since 1674. Nordic Institute of Asian Studies. Bunker, Gerald (1972). The Peace Conspiracy: Wang Ching-wei and the China War, 1937-1941. Cambridge, Massachusetts: Harvard University Press. ISBN 978-0674-65915-5. Ch'i, Hsi-sheng (1982). Nationalist China at War: Military Defeats and Political Collapse, 1937–1945. Ann Arbor: University of Michigan Press. Chiang, Kai Shek. The Soviet Russia in China. Chiang, Wego W. K. How the Generalissimo Chiang Kai Shek gained the Chinese- Japanese eight years war, 1937–1945. Cotterel, Arthur (2009). Western Power in Asia: Its Slow Rise and Swift Fall, 1415–1999. Wiley. Dorn, Frank (1974). The Sino-Japanese War, 1937–41: From Marco Polo Bridge to Pearl Harbor. Macmillan. Hsiung, James C.; Levine, Steven I., eds. (1992). China's Bitter Victory: The War with Japan, 1937–1945. Armonk, N.Y.: M. E. Sharpe. Jowett, Phillip S. (2004). Rays of The Rising Sun, Armed Forces of Japan's Asian Allies 1931–45, Volume I: China & Manchuria. Solihull, West Midlands, England: Helion & Co. Ltd.
MacKinnon, Stephen; Lary, Diana (2007). China at War: Regions of China, 1937–1945. Stanford University Press. Max, Alphonse (1985). Southeast Asia Destiny and Realities. Institute of International Studies. Mote, Frederick W. (1954). Japanese-Sponsored Governments in China, 1937–1945. Stanford University Press. Newman, Joseph (March 1942). Goodbye Japan. New York. Pollard, John (1014). The Papacy in the Age of Totalitarianism, 1914–1958. Oxford University Press. ISBN 0199208565. Smedley, Agnes. Battle Hymn of China. Wang, Wei (2016). China's Banking Law and the National Treatment of Foreign-Funded Banks. Routledge. Young, Ernest (2013). Ecclesiastical Colony: China's Catholic Church and the French Religious Protectorate. Oxford University Press. pp. 250–251. ISBN 0199924627. Wikimedia Commons has media related to Reorganized National Government of China.